Pancit Batil Patung (or batil patong) is Tuguegarao’s version of stir fried noodles topped with a fried egg topping (the patung or patong) and served with a siding of egg drop soup (called batil) plus soy sauce, spicy vinegar, and lots of raw onions. 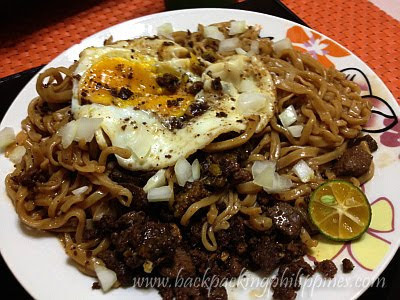 the unique texture of the noodles and the siding and raw spices make this noodle dish unique from other regional pancit recipe specialties. If you're looking for pancit batil patong in Manila, there's Rapsatodits restaurant on Roosevelt avenue near Frisco (between Sto. Nino St and M.H. del Pilar in front of EastWest Bank) for only P60/order good for 2-3 persons already unless you have a big tummy. there's also the special order for P80 with lots of toppings but Tutubi has yet to try it. 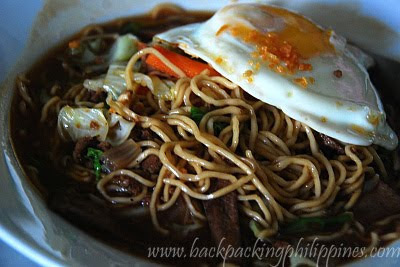 where is the best pancit batil patong recipe available? Tuguegaran, Cagayan? Kalinga? This food looks good; thanks for the introduction to Pancit Batil Patung.